What is a catechism? All faith systems have a basic structure, an outline to guide their adherents in understanding and following the basic tenets of that faith. Lutheran Christianity is no different, and the Small Catechism of 1529 was Martin Luther's proposal for an authentic Christian outline. In 1517 Fr. Luther, Roman Catholic priest and university professor, broke with the traditions of the Roman Church by asserting that the center of Christian faith had been obscured by centuries of bad theology and corrupt church practices. He established what he saw as the foundational center of the Christian faith -- that God's Law declares us in need of a Savior; that the Gospel announces that Savior to be Jesus of Nazareth, executed under Roman authorities in Jerusalem in AD30, whose resurrection on the third day opened the way of salvation to all who would accept Christ through faith alone; and that life lived in Christ is directed and sustained by the Holy Spirit through abiding in the Word of God and the sacraments of Baptism and Communion. “Three things people must know in order to be saved. First they must know what to do and what not to do. Second, when they realize that they cannot measure up to what they should and shouldn’t do, they need to know where to find the strength they need. Third, they must know how to seek and obtain that strength. “It is just like sick people who first have to determine the nature of their illness, then find out what to do or leave undone. After that they need to know where to get the medicine which will help them do or leave undone what is right for a healthy person. Third, they have to desire to search for this medicine and to obtain or have it brought to them. In the pages that follow, the Small Catechism is listed in its Six Chief Parts, providing a structure for Christian faith and life. Notes about the Small Catechism: The following six responsories are based on the Small Catechism of Dr. Martin Luther, prepared in 1529 as a handbook for Christian instruction for personal, household and congregational use. They were intended to form the basis for the Christian Church’s teachings, rooted in the essential biblical teachings of law, grace and prayer, and the sacramental daily rhythm of baptism, repentance and eucharist for Christian life. Martin Luther organized the Small Catechism around what he saw as the core biblical writings and doctrines of the Christian faith: the Ten Commandments, the Creed, the Lord's Prayer, Holy Baptism, Repentance and Holy Communion. He urged congregations to include sections of the Catechism as regular features of the public worship at all times of year, to keep the Church rooted in the evangelical Faith. 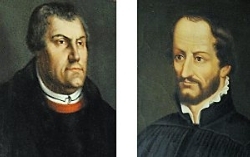 Luther also saw the Christian home as an essential setting for teaching the faith, and instructed parents to accept their role as teachers and nurturers of the baptized in their care. At mealtime, bedtime, family time -- at all times and places parents are to see to the instruction of children in the rudiments of Christian Faith and Life. May God bless us as we claim anew, in our hearts and home, in worship and daily living, the core of our baptismal hope in Christ Jesus. Come Holy Spirit!